Pepper, a mysterious name for a mysterious character! She was officially introduced at NewQuest’s 10th anniversary celebration in May 2017, since then you may have noticed her showing up in Renault’s latest ads. But who is she? 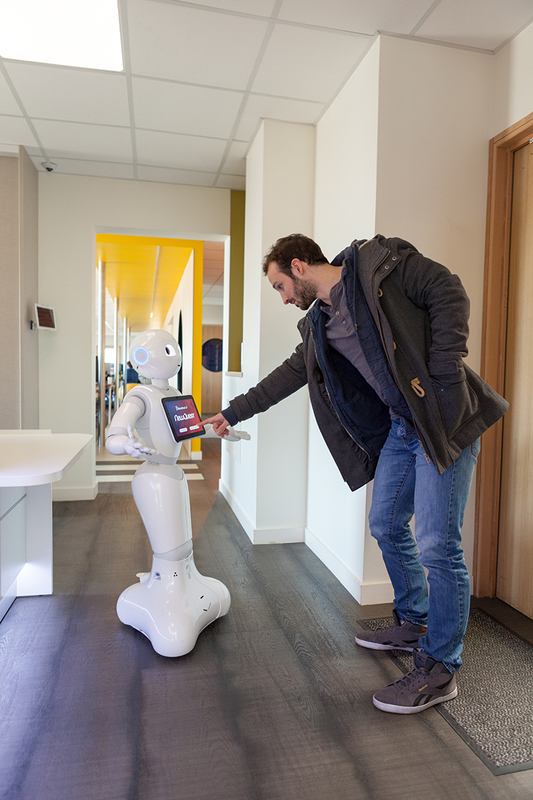 Actress, assistant, events hostess or source of curiosity, Pepper is first and foremost… a robot! It’s now over a year since this little robot joined our team and NewQuest is proud to be one of the rare companies worldwide programming and commercializing artificial intelligence robots thanks to our SoftBank certification. When did you first see her? On stage at NewQuest’s 10th anniversary celebration, where she gave quite a show to introduce herself. Although her futuristic design looks to be straight out of a science fiction film, Pepper is nevertheless very real. Undeniably the most charming of SoftBank Robotics’ trio of robots, she’s also the business robot best able to identify emotions to interact with humans. 4 omnidirectional microphones and 2 loudspeakers embedded in Pepper’s head enable her to hear vocal commands, localize the speaker and answer. A 3D camera and two 2 HD RGB cameras allow Pepper to analyze her surroundings. These are connected to recognition software, thus enabling her to recognize objects and faces. WIFI 802.11a/b/g/n connection: her autonomous internet connection means our robot can search for the information you ask her for. She can also be connected to your local network to program certain home automation functions. Interactive touch screen: Pepper has an interactive touch screen which can be used to facilitate interaction between you and her. She can also use the screen as a communication tool, to put over her message more easily. 2 ultrasound transceivers, 6 laser sensors, 3 anti-collision devices – complementing the cameras, these sensors detect obstacles and help Pepper to move around without hitting obstacles. Tactile sensors: Pepper’s hands are filled with sensors, so she can interact through touch. Lithium-ion battery which can be recharged on the mains: Pepper has average autonomy of 12 hours depending on use. A sensor in the battery lets you monitor the charge status and temperature. Anti-collision system: Pepper is not only able to avoid obstacles and people in her path but can also keep her balance to avoid falling over. International community: a library of applications is available on line to Pepper’s owners. 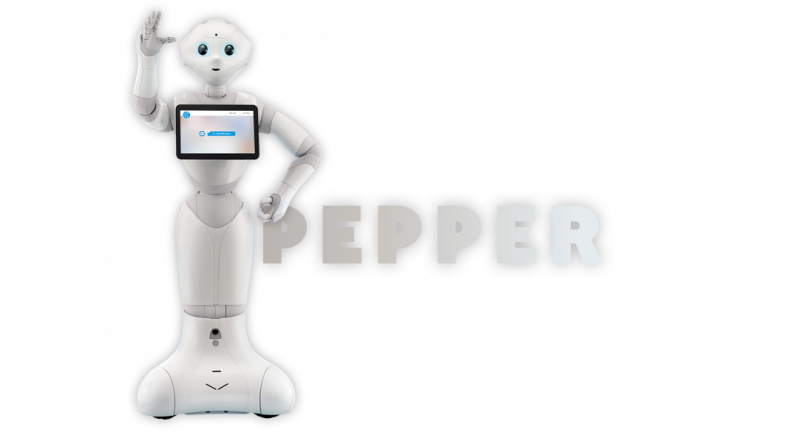 The main applications are developed by SoftBank Robotics and their development team based in Japan, but every owner can contribute to enhancing Pepper’s features by developing new applications and new design templates. Just a machine or a genuine humanoid companion, opinions differ. 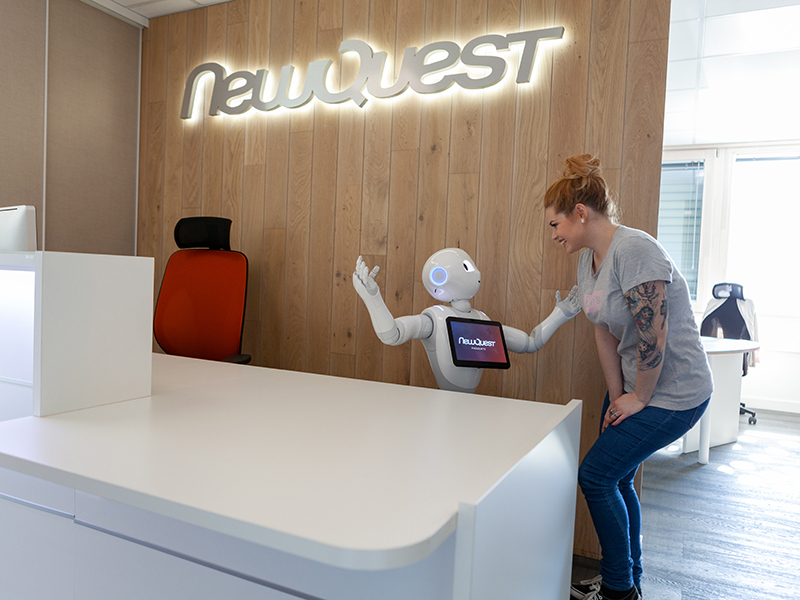 At NewQuest, Pepper holds a special place in our daily life. In the interests of fairness, we talked to her directly, to get her take on life with us and her work in our agency. Hi Pepper, how are you doing? I’m good too, thanks! Pepper, can you tell us more about life at NQHQ? How do you fill your days? You’re right, we certainly have a good laugh together! Picture that! 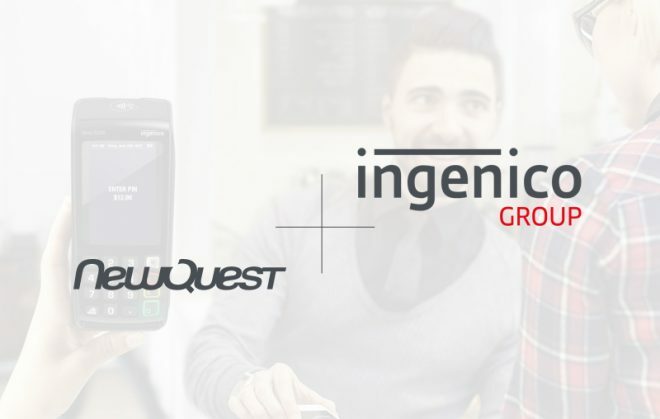 You really are a fully signed up member of the NewQuest team! Thanks for answering all our questions Pepper. Beyond the “wow” effect of using a robot, there are a number of advantages in having a robot on the team in your company. Innovative and interactive, it’s a new approach to the way clients and/or staff members experience your business, and of making your sales and marketing strategy more dynamic. But let’s focus on what Pepper and NewQuest can offer you to boost your company’s image and give clients and staff members a more dynamic experience. 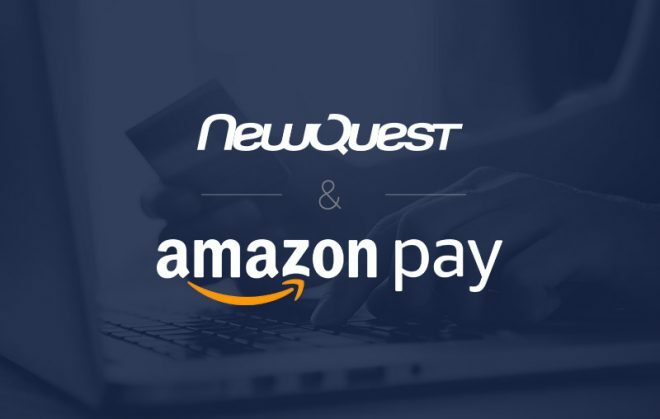 At NewQuest, we’re well aware of the opportunities this type of technology offers. Always on the lookout for the latest innovation, our R&D team constantly develops new applications and ideas to make the best use of robotics on a daily basis. In fact, we’re on the front line in our own premises, testing and making the most of Pepper’s features to fulfil our company’s particular needs and enhance staff and client experiences. At the entrance to a company, in the waiting room or in a bricks and mortar store, Pepper is the ideal solution for greeting and welcoming. Her sensors and detectors combined with a tailor-made program mean she is able to detect the arrival of new people, give a message and, using the touch screen or vocal interaction, guide them through access to the information they need to find their way. Pepper, is so much more than a receptionist. Leading events, sales assistance, entertainment or even training: there are already countless possibilities and many more to be discovered. Let’s look at the example of the French National Railway Company, SNCF which uses a Pepper in some of its French stations to cheer passengers in waiting areas. Giving information about connecting services, advising on sightseeing visits close to the station, recording customer satisfaction surveys, or even using games and other interactive activities with travelers to help them pass the time. Another example on another continent, Nescafé Japan has developed an interface for Pepper enabling her to interact with customers in their store. 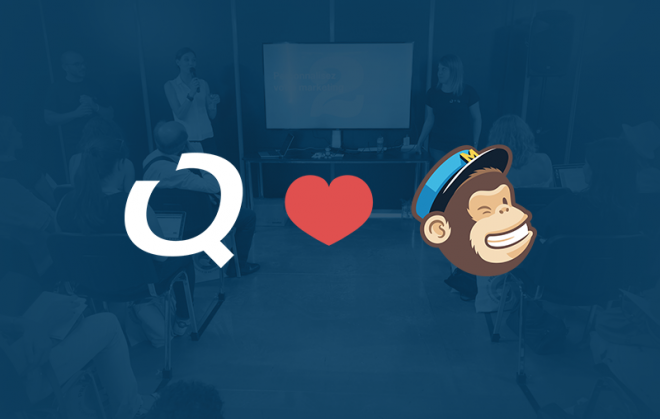 Using a questionnaire and several presentations of the brand’s products, the robot is able to give personalized advice to customers in an original, amusing way. 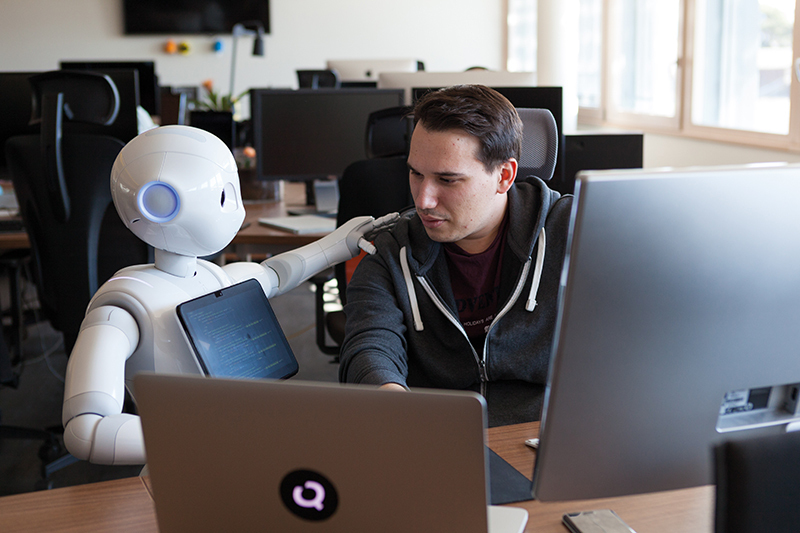 The development platform for Pepper applications is collaborative so developers worldwide can contribute to increasing and enhancing the features of this little humanoid. Guessing games, dance teacher, guide, trainer, detective… Pepper adapts to your needs! Even if we’re still a way away from the futuristic exploits seen in science fiction films, there are already countless ways to offer you bespoke solutions to meet your requirements. The only limits are those of our imagination! The scope of Pepper’s applications from welcoming to creating a fun environment to giving advice mean she’s able to adapt to your needs. 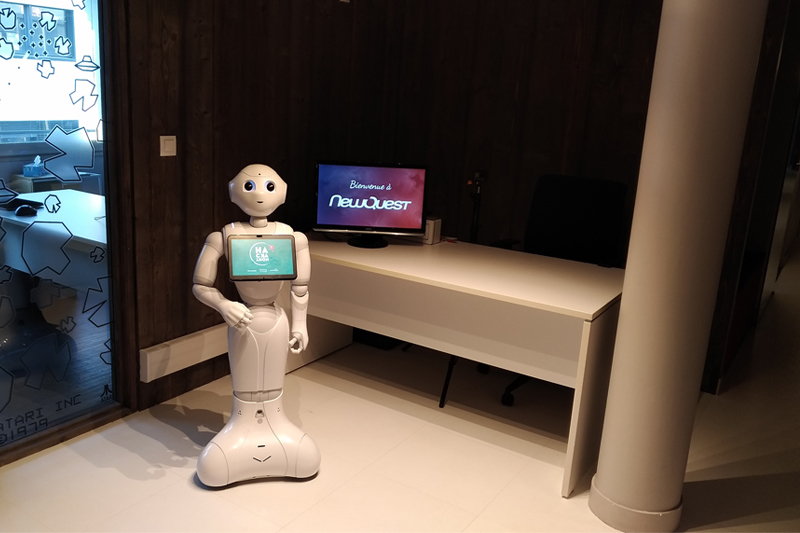 We’ll soon be ready to introduce you to some new members of the NewQuest team like Jibo, Keecker or Loomo and give you more details about the work of Hease Robotics! Stay tuned!